When it’s time for Mr. Faraway to make the long trip back home, the following day, I send him with one other small gift – an extra handout from a class I took the previous week on German holiday treats. He knows how to pronounce lebkuchen, my favorite from the class, and knows details about them, too, like the fact that they keep for weeks and actually improve with age. Because it was a class, I don’t have any extra to offer him, but he samples my homemade citrus peel that is waiting to be made into cookies, and appreciatively takes the recipes with him, along with a few more he copies out of one of my cooking magazines. I took the class the week before his visit, with a friend, who persuaded me to sign up for it months ago, and our daughters, both 13. I completely forgot about the class until she reminded me, and it was a refreshing break with the routine of years past, where I hosted an annual holiday cookie exchange. All the work of the party meant that every year, I made the same cookies, because I didn’t have time to experiment or run the risk of a new recipe that didn’t work out. This year, we made four kinds of cookies and treats, all with German origins, like myself, my friend, and Mr. Faraway: Lebkuchen, Almond Crescents, Burnt-Sugar Almonds, and Spitzbuben (raspberry jam sandwich cookies). The four of us took turns rolling out long ropes of almond dough, which was fun, although we found the resulting cookie fairly dry – probably good with a hot cup of tea or spiced cider, not so good on its own. The Child and her friend favored the Spitzbuben, mostly for the raspberry jam, but also because they liked saying the name. It was hands down the most photogenic cookie of the evening, so the two girls started instagramming spitzbuben, then when the cookies were all eaten, checking out each other’s Instagram profiles. My favorite, though, were the lebkuchen, cakey-soft and highly spiced, studded with lively bits of chopped orange peel. The cookie is perfect on its own, though not especially pretty to look at. The class was fun and taught by Erin Coopey, a local chef and author of The Kitchen Pantry Cookbook . As we waited for the cookies to bake, she told stories about German holiday markets and Christmas traditions. Holiday traditions are wonderful, especially when they’re new. Preheat oven to 350 degrees. Grease 2 large baking sheets. Place nuts, flour, cocoa, cinnamon, ginger, cloves, salt, baking powder and baking soda in a food processor, and process until the nuts are ground into a flour. Beat together brown sugar, honey, and butter in a large bowl with an electric mixer at medium-high speed until creamy. Add eggs one at a time, beating well after each addition. Mix in nut flour at low speed until just blended, then stir in orange peel. Roll tablespoons of dough into balls with dampened hands, then put on baking sheets and flatten slightly. Dough will spread during baking. 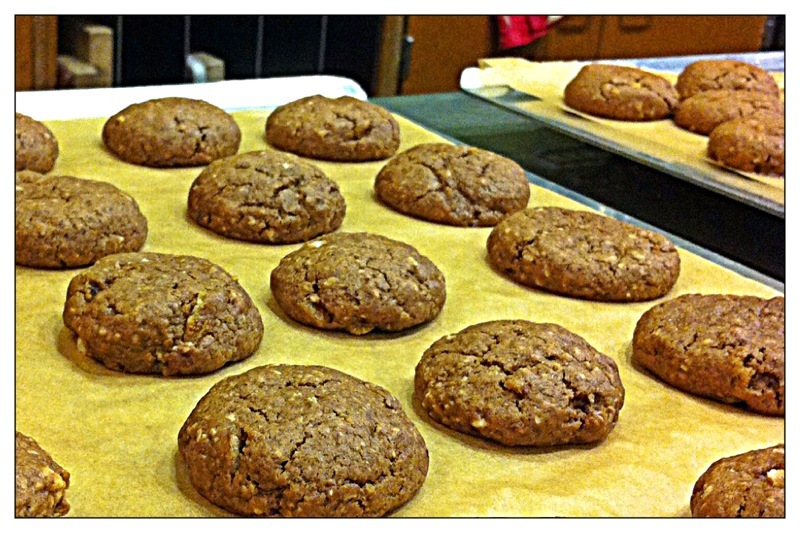 Bake about 15 minutes, until surface of cookies no longer appears wet. Transfer to racks to cool. Make icing: Sift powdered sugar into a bowl, then stir in water until smooth. Evenly brush cooled cookie tops with icing. Let set one hour.